Barmouth is the ultimate Welsh seaside resort, with shops, restaurants and cafés all bustling for attention with THAT beach. Steve Goodier reports. I have fond memories of Barmouth. It was my parent’s preferred Welsh destination for a seaside day out or caravanning weekend when my sister and I were young. It was an idyllic place for kids to be taken to with a superb beach, a small fair, some arcades, donkeys, swing boats and lots of shops selling souvenirs and beach products. Little has changed. Barmouth is a timeless resort that was much loved by The Victorians but still has a place in the itinerary of the modern day holidaymaker. Its location has much to do with its popularity – it’s is situated on the West Coast of North Wales and falls just within the boundaries of the south west corner of Snowdonia National Park and lies between Cardigan Bay and the foothills of the awesome Rhinog Mountains which are roughest and oldest range in Wales. Walking in these hills demands stamina and good navigation skills if you venture into the main areas around Rhinog Fawr and Rhinog Fach (a little north of Barmouth) but rambling around the smaller hills above the town can be great fun and gives stunning views of town, estuary and sea. With an ‘off-season’ population of less than 3,000, Barmouth’s bars, restaurants and cafés soon get packed in summer when this number grows substantially with visitor’s intent on exploring not just the beach, but the old town, with its steep steps and slate roofed cottages clinging to the hillsides. The harbour takes some beating as well – the town is sited at the mouth of The Afon Mawddach and a great evening stroll enjoyed by many is to walk across the Barmouth Bridge that spans the river and links it with The Fairbourne side. In my opinion you also get the best view of Barmouth (and its sheltered location) from the beaches of Fairbourne, and if you plan to be there as the sun goes down you get a truly spectacular view. Inland from the estuary and the town, and rising above nearby Dolgellau, is one of Snowdonia’s most famous mountains, Cadair Idris. At 2,930ft it was reputed that the giant Idris Gawr sat on its summit (the name means ‘Chair of Idris’) watching for enemies. It’s a tough climb to the top but The Pony Track and Minfford Paths are well worth walking and relatively easy to follow but, be warned, if you leave it late in the day and decide to overnight in the small hut near the summit legend has it that you will wake up either mad or a poet! It’s something I have done twice and I haven’t become a poet – as for the other… But let’s return to Barmouth itself. You can’t look at the town without making mention of the glorious beach which seems to stretch north forever towards Dyffryn Ardudwy and Harlech. Its ‘classic seaside territory’ with miles of golden sands. For kids it is a paradise of donkey rides, ice creams, old fashioned beach attractions (such as the aforementioned swing boats and trampolines) and as much space to dig and build sand castles as you could ever wish for! Back from the beach there is a maze of streets with small shops to go browsing in and plenty of pubs, cafes, restaurants and fish and chip shops to satisfy the hungry and thirsty. But away from shops, beaches and arcades there is still much to see with The RNLI Lifeboat Station and The Ty Gwyn House and Museum all being worth a look. The town is serviced by The Cambrian Railway line and has its own station and The Barmouth Ferry sails from the harbour to Penrhyn Point where you can link up with the historic Fairbourne Narrow Gauge Railway and enjoy a trip behind a miniature steam train. 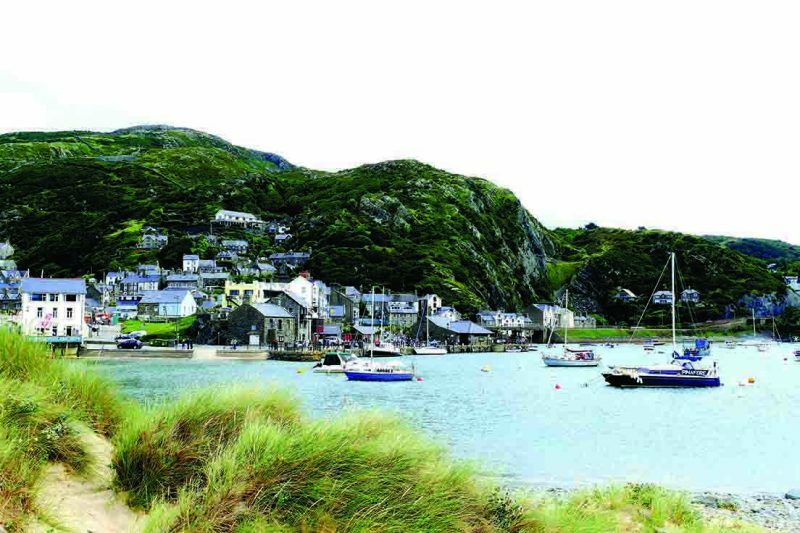 Barmouth grew around the ship building industry but today relies heavily on tourists. However, its link with the sea remain as the town is the starting point for ‘The Barmouth to Fort William Three Peaks Race’ which involves sailing from Wales to Scotland via England and climbing the highest peaks in each country as you do so – Snowdon, Scafell Pike and Ben Nevis. This involves, as well as the sailing, 72 miles of running and 11,000ft of ascent. It’s not for the fainthearted! In ‘season’ (from March to October) Barmouth’s many camping and caravanning sites are well used (and often crowded) and when the weather settles and we get some days of ‘traditional’ summer with blue skies and little wind, there can be few better destinations to be in. Barmouth boasts one or two famous people with Major Harold William ‘Bill’ Tilman CBE, DSO, MC and Bar (1898 – 1977) having lived in the town for many years. He was a prolific mountaineer and exploratory sailor who wrote numerous books and was one of the earlier explorers of The Himalayan Mountains. He disappeared while sailing to The Falkland Islands in his eightieth year! More recently EastEnders actress Charlie (Charlene) Brooks hails from the town. There are literary connections here too. J.R.R. Tolkien visited in the early 20th Century and was so smitten by what he saw he used the Old Town as a model for the town of Hobbiton in ‘The Lord of the Rings’. An even early visitor to Barmouth was the prolific poet and traveller William Wordsworth who wrote the following about it – ‘with a fine sea view in front, the mountains behind, the glorious estuary running eight miles inland and Cadair Idris within compass of a day’s walk, Barmouth can hold its own against any rival’. Like I said to begin with – little has changed down the years!